In our last post of this series, we looked at how text searches work with the FileMaker search engine. 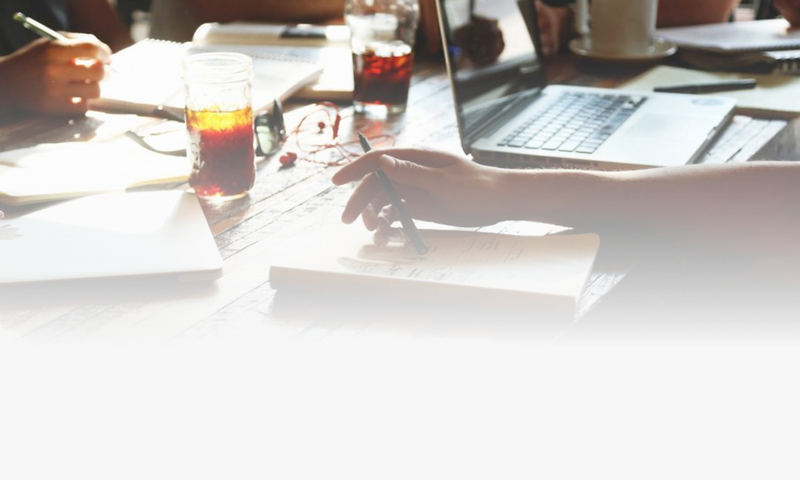 In this post, we will consider searches in fields defined as number or date. 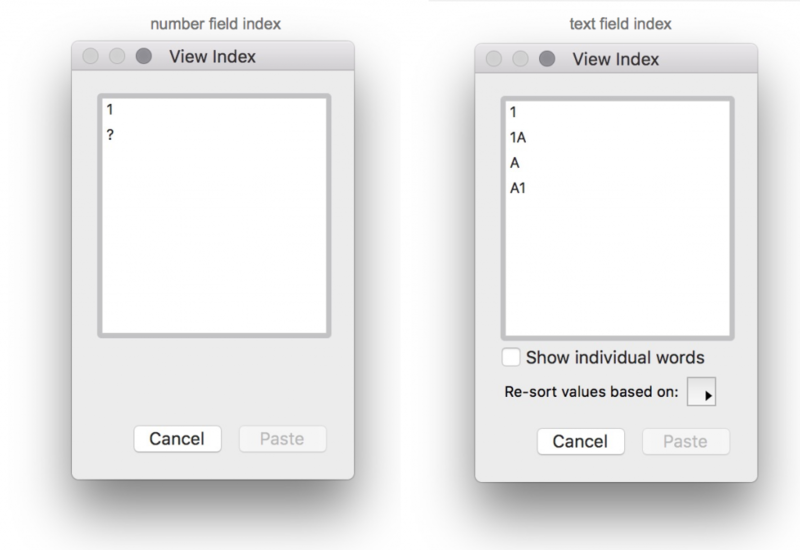 Fields defined to store number data behave differently to standard text fields. The first difference is in how the data is indexed. Indexing is used for searching data. In the text field, each value is different. In the number field, the first three values are indexed as 1; the last value (A) is seen as an invalid value (?). If you search in each field for A, the text field will return two records (A1 and A) while the number field will return one record (A). Sorting by the number field results in the order 1, 1A, A1, A; while the text field returns 1, 1A, A, A1. Although it is possible to enter non-numeric characters into a number field, it is not recommended. A field validation exists to enforce a strict data type for number fields being Numeric only. In the following examples, we will use a set of records numbered 1 to 1000. When searching for numbers, standard searches return only the complete number. A search for 20 would return just one record. The same search in a text field would return 11 records – 20, 201, 202, … 208, 209. To search for a range of values in a number field, use the ellipsis (…) operator. A search for 110…119 will return 10 records. The search is inclusive – all values from 110 through to 119. If they existed, this range search result would include decimal values such as 112.34 but not 119.01. The ellipsis can be entered as the actual symbol (on macOS option-; or selected from the operators list in Find mode). Or it can be entered as three periods. And FTW – it can also be entered as two periods! Still works. To search for all values above or below a certain value, use the comparison operators: > < ≥ ≤ For our sample records above, a search for ≥900 will return 101 records. Again, these symbols can be selected from the operators list in Find mode or they can be typed on macOS – option-> will give ≥. The ≤ and ≥ symbols can be typed as two characters as they are said. So type >= for “greater than or equal to”; type <= for “less than or equal to”. FileMaker does permit wildcards in number searches. One wildcard specific to numbers is # which represents one missing digit. So a search for 9#0 returns 10 records – 900, 910, 920, … 980, 990. A search for ## will find all two digit numbers. The asterisk * is also supported as for text fields. A search for 90* will return 11 records – 90, 900, 901, … 908, 909. A search for *99 returns 10 records – 99, 199, 299, … 899, 999. And *99* returns 19 records (try it out). In the following examples, we will use a set of 1000 records containing all the dates from 1/1/2016 through 26/9/2018. Dates stored in date fields are handled as integers (whole numbers) representing the number of days since the beginning of FileMaker time. The beginning of FileMaker time is 1 January 0001. So the date, 2/5/2018 (2 May 2018) converts to 736816 (days since the start of time). 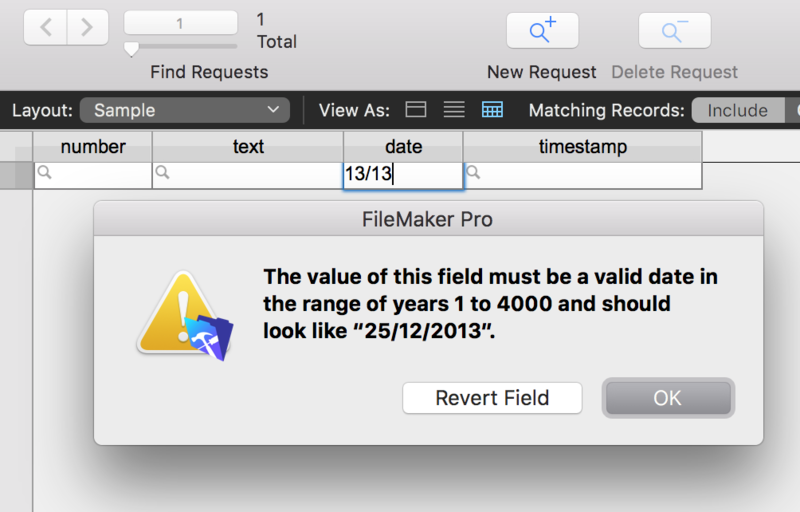 FileMaker also defines the end of time – it is 31/12/4000. Beware! Therefore, when sorting by a date field, the records are effectively sorted in numerical order which will match chronological order. As for number fields, searches in date fields can use the range and comparison operators. A search for 1/1/2017…31/3/2017 will return 90 records from January, February and March of 2017. A search for ≤31/12/2016 will return 366 records (2016 was a leap year). FileMaker permits the use of the asterisk * wildcard in date searches. A search for */3/2017 will return 31 records (all the days in March 2017). A search for */3/* will return 93 records (all days in any March or any year). A search for */*/2017 will return 365 records (all days in 2017). Rather than using the wildcard, you can also use a short version of the date for the search. For the above examples, you could search for either 3/2017 or 2017. If you search for 3, this will return all records in March in the current year. Short dates can also be used in range searches. For example, 1/2017…3/2017 find all dates Jan-Mar 2017; and 2017…2018 finds all dates in 2017 and 2018. To understand how these abbreviated date searches are working, do the search and then Cmd/Ctrl-R (Records > Modify Last Find). This will show how a valid date has been constructed using wildcards. Try it out! And finally, the day search supports range searches such as mon…fri 3/2017 to find all weekdays in March 2017. Searching for records containing today’s date (as defined by the client operating system) is easy with the // operator (two forward slashes). In the next post, we will look at searches in other field types not covered so far.